The swiftly developing packaging industry is a key factor driving growth of the release liners market. Rising preference of consumers for high-quality and innovative packaging is boosting adoption of release liners which is benefiting for growth of the global release liners market. Furthermore, increasing investment in packaging across numerous industries such as the food and beverages and pharmaceuticals are enhancing growth of the global market for next few years. Additionally, rising label printing technology and growing demand for film-based liners are creating lucrative opportunities for key players operating in the release liners market. However, need for proper disposable methods in order to reduce wastage is bolstering growth of the global release liner market. Additionally, low purchasing power of the numerous manufacturers are restraining growth of the global release liner market. According to the report by TMR, the global release liner market was valued at around US$10.0 bn in 2015 and is anticipated to expand at a CAGR of around 6.30% from 2016 to 2024 to attain value of US$17.0 bn by the end of 2024. In terms of volume, the market is expected to expand with a CAGR of 7.40% over the same period of prediction. On the basis of application, the global release liner market is segmented into envelopes and packaging, graphic arts, hygiene, industrial, medical, pressure sensitive label stock, tapes, and others. Of these, envelopes and packaging is dominating market due to higher demand for better packaging for storing the goods. However, the demand for release liners in graphic arts is increasing which is likely to fuel growth of the segment in next few years. On the basis of labelling technology, the market is segmented in to adhesive applied, in-mold, pressure sensitive labeling, and sleeving. Of these, pressure sensitive labeling is dominating the global release liners market and expected to account for 44% shares of overall market in next few years. High growth of this segment can be attributable to the rising need for packaged food and improved packaging for beverages are fuelling growth of the global release liner market. However, sleeving is expected to expand with faster CAGR over the forecast period due to high level of efficiency. 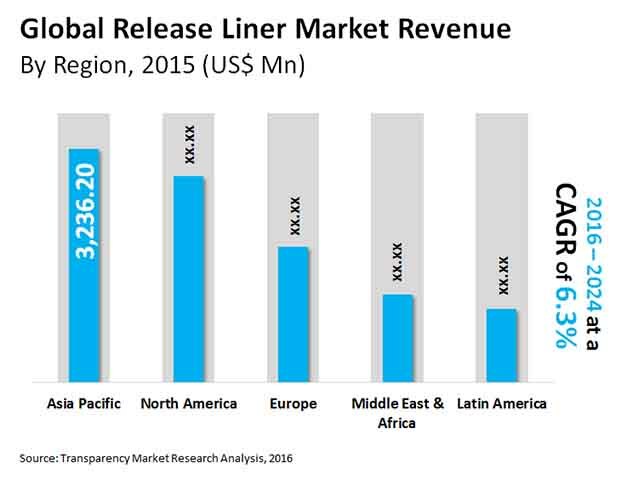 On the basis of region, the global release liner market is segmented into North America, Europe, Asia Pacific, Latin America, and Rest of the World. Of these, Asia Pacific is dominating the global market for release liner owing to presence of large pool of manufacturers in the region. Thanks to these factors, the global release liner market accounted for US$3.2 bn in 2015. Additionally, growing construction industry in the region is fuelling growth of the global release liner market. Thanks to this factor the region is expected to remain dominant over the forecast period. Key players operating in the release liner market include Mondi Group, Avery Dennison Corp., 3M, Gascogne Group, UPM, and Rayven Inc. These companies are facing intense competition due to presence of numerous local players. The local players have improved their production capacity substantially. This factor will likely to intensify the competition for next few years. This report provides forecast and analysis of the release liner market on the global and regional level. The study provides historic data of 2015 along with forecast from 2016 to 2024 based on volume (Mn m2) and revenue (US$ Mn). It includes drivers and restraints of the release liner market along with their impact on demand during the forecast period. The report also comprises the study of opportunities available in the market for release liner on the global and regional level. In order to provide the users of this report with comprehensive view of the market, we have included detailed competitiveness analysis and company players with unique selling propositions. The study encompasses market attractiveness analysis and basis point share analysis, by application, substrates type and labeling technology. Market numbers have been estimated based on the average usage of release liner for different kinds of substrates such as film, glassine, polyolefin paper, clay coated paper and art paper. Market size and forecast for each segment have been provided in the context of global and regional markets. Market dynamics prevalent in China, Japan, South Korea, North America, and Europe have been taken into account for estimating the growth of the global market. Market estimates for this study have been based on volume, with revenue being derived through regional pricing trends. The release liner market has been analyzed based on expected demand. Market data for each segment is based on demand volume and corresponding revenue. Prices considered for the calculation of revenue are average regional prices obtained through primary quotes from numerous regional manufacturers, suppliers, and distributors. All market numbers have been derived on the basis of demand for release liner in different applications in different regions. All existing key end-users have been considered and potential applications have been estimated on the basis of secondary sources and feedback by primary respondents. Segmentation comprises demand for release liner in all the regions and important countries in the region. Application segmentation includes current and estimated demand of release liners for applications such as envelopes & packaging, graphic arts, hygiene, industrial, medical, pressure sensitive label stock and tapes segment. While labeling technology segmentation includes present and forecast demand for release liner with technology such as adhesive applied, in-mold, pressure sensitive labeling and sleeving. Substrates segmentation includes current and estimated demand of film, glassine, polyolefin paper, clay coated paper and art paper. Regional demand patterns have been considered while estimating the market for various application for release liner in different regions. We have used the top-down approach to estimate the global release liner market, split by regions. The global application, labeling technology and substrates segment of the market has been derived using the bottom-up approach, which is cumulative of each region’s demand. Regional demand is the summation of sub-regions and countries within a region. Market share of companies has been derived on the basis of revenues reported by key manufacturers. The market has been forecast based on constant currency rates. Several primary and secondary sources were consulted during the course of the study. Secondary sources include OneSource, Factiva, Hoover’s, International Federation of Robotics (IFR), Robotics Industries Association (RIA), Magazines published by the ABB Limited, label expo, packaging world, Alexander Watson Associates BV (AWA) and company annual reports and publications among many others. The report provides detailed competitive outlook including market shares and company profiles of key participants operating in the global market. Key players in the global release liner market include Mondi, Avery Dennison, 3M, Gascogne laminates, Rayven Inc., UPM Reflatac and Loparex. Company profiles include attributes such as company overview, financial overview, business strategy and recent developments.